June 12, 2006 1 Comment FXI. Great article in the WSJ today on the rising cost of apartments in China, and the efforts of a Zou Tao, a citizen blogger, to bring the issue to the attention of the public. He argues that it is the work of rampant speculation and is leading a grass-roots campaign to educate the public and influence the government. While the focus of the article is on Mr. Tao there is great statistical information about the rising costs of housing and the socio-economic impact it is having in China. Recent events in China (currency exchange deregulation, failure to reign in lending, commodity price explosion, end of cheap money worldwide, rampant speculation in multiple sectors) have me concerned. There isn’t one particular piece of news or event that I can point at but when summed together qualitatively it feels like a negative trend. I stand by my personal view that the greatest test of China’s ascendency is yet to come, and the unwinding of the incredible industrial production and property boom is an event that could provide the trigger. China’s future will be shaped by how they face this challenge. It will also provide an excellent investment entry point. It would be valuable to have lived in the USA during 1890-1950 and have used those experiences to view the developments in China. The USA was plagued by the same problems as China during these times. Someone with such experience might be less alarmist than I. Regardless, it certainly is positive when a Chinese capitalist unwittingly channels Voltaire. Li Ning, a marketing manager for Shenzhen’s newest office tower, the 52-story Times Square built by Hong Kong-backed Excellence Group, offers a guarded view of Mr. Zou’s campaign. “I may not agree with what he says, but I support his right to say it,” he says. 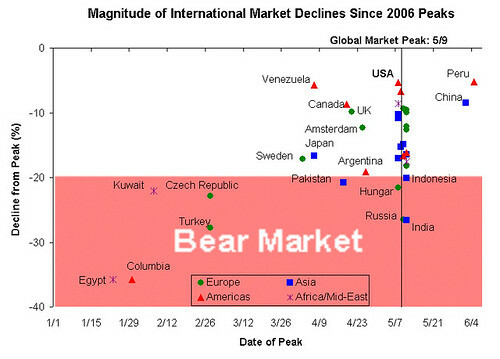 Birinyi Associates published a snapshop of global bear markets this weekend. Note China’s position in the upper right. I completely exited an investment in IShares FTSE/Xinhua 25 ETF (FXI) (4/28 and 5/24) based on the increasingly negative confluence of economic events I saw in the non-mainstream press.